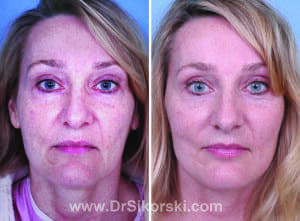 The Active Lift™ developed by Dr. Sikorski is a minimally invasive affordable way to tighten the lower face with very low downtime, no sedation or optional requested oral sedation. General anesthesia is not required in this quick-recovery procedure and many Mission Viejo and Orange County patients prefer to be awake during the procedure. How does the Active Lift™ work? The Active Lift™ uses internally placed permanent “lifting sutures” which essentially tighten up the contours of the lower face, lift the lower cheek and tighten loose skin on the neck. A fine line incision is made in the hidden areas of the hairline and inside the front of the ear to conceal the hairline scar. Subtle undermining allows excess skin to be snipped away and the sutures to be placed in the SMAS (superficial musculature) where they will provide a strong even lift and support for the newly repositioned trimmed facial tissue. How is the Active Lift™ performed? Many Mission Viejo and Orange County patients think you need to be asleep for facelift surgery. With newer local anesthesia, this is no longer the case. With the Active Lift, Dr. Sikorski will first numb the areas of your face so you will not feel any of the work being done. An incision is made in the front interior part of the ear into the hairline above and behind the ear. An area of skin and support structures in front of and above the ear is undermined (loosened) to allow the permanent lifting sutures to be placed. An additional internal suture is placed in the area beneath the lower jaw to tighten the upper neck. Excess skin is snipped and the incision is closed with tiny sutures placed by hand. (Dr. Sikorski does not use staples which can place undue pressure on skin and result in a wide and irregular scar). D o the Lifting sutures of the Active Lift™ last? The Active Lift™ is not the same as barbed suture procedures which proved to be unstable and short lived. The Active Lift™ anchors the sutures within the strong fascia support tissues which lie between the deep levels of the skin and the muscle. These are permanent full strength surgical sutures and do not dissolve or break. Correct placement and suture integrity are important as both help insure proper support and the natural appearance that you wish to maintain. Results last for years instead of months. Will I look like I’ve had a facelift? Not at all. The Active Lift™ does not risk giving you a pulled or surgical look at all. In fact, unless you tell your friends you have had a surgical procedure, they will most often think that you have lost weight and are happier about your life. Should I compare Active Lift™ to the Lifestyle Lift™? All surgeons have their own specialized techniques. Lifestyle Lift™ is a widely known name for what appears to be similar to the idea of a mini lift – or in some cases similar to a lower facelift. It is available across the country from a variety of surgeons. As with any procedure, vetting your surgeon is a wise step. There are opinions all over the map about how this and other widely-used techniques perform. “As far as comparing, I don’t compare my surgical procedures to others because I can’t speak for how other surgeons make their assessments or perform their surgeries. This is a common question I receive during consults and from my long-standing patients. My Active Lift techniques are pretty well explained here and I’m always pleased to chat with patients during a consult so all questions can be answered.” Do your homework. Check the social sites – www.Realself.com is an excellent patient review social site that has real patient commentary and in some cases, photos. You’ll find both positive and negative opinions. Do other doctors use the Active Lift technique? The Active Lift™ includes internal suture placement which tightens the upper neck. 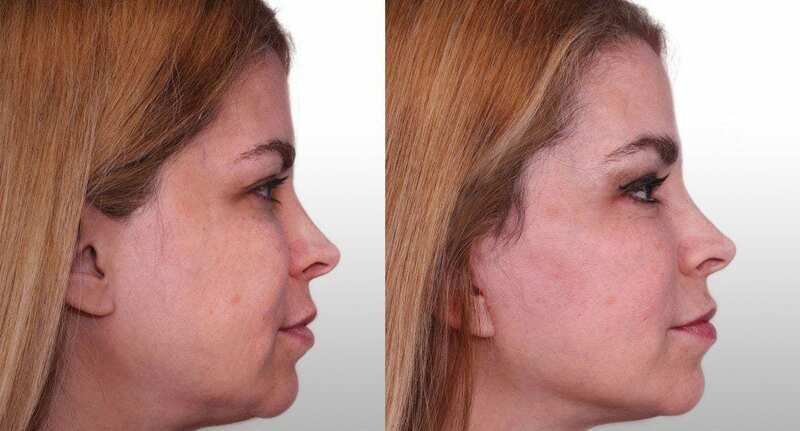 Although not a replacement for a necklift if you have excessive skin in the neck or liposuction if you have accumulated fat deposits, for a great majority of Mission Viejo and Orange County patients, these suture placements provide excellent results that last for years. How much does the Active Lift™ cost? The Active Lift™ varies in price based on the procedure and optional oral sedation for those Mission Viejo and OC patients who tend to be more anxious and prefer the extra relaxation it provides. We don’t hide costs or force you to come in just to get cost information. You can call us or request an online consult for additional information. If your requirements are such that you would benefit from additional procedures such as one of the variations of necklift or liposuction, these are available at additional fees. When more than one procedure is performed during a single surgery session, the fees are combined and discounted into a comprehensive total cost. If you prefer to finance your surgery, we’re partnered with Care Credit. Applying for financing is a simple instant process. At 0% Interest for up to 12 months, it’s a nice option. Learn more about Active Lift™ in the Mission Viejo and Orange County area. Schedule an appointment with Natural Image OC online or by phone at (949) 448-0487.